A busy weekend for the Christchurch (NZ) team over the weekend. Saturday was the Malvern A&P Show. A large site was hired and a bouncy castle was set up for kids to play on while gospel conversations were had with the parents, as well as the usual flip chart set up. 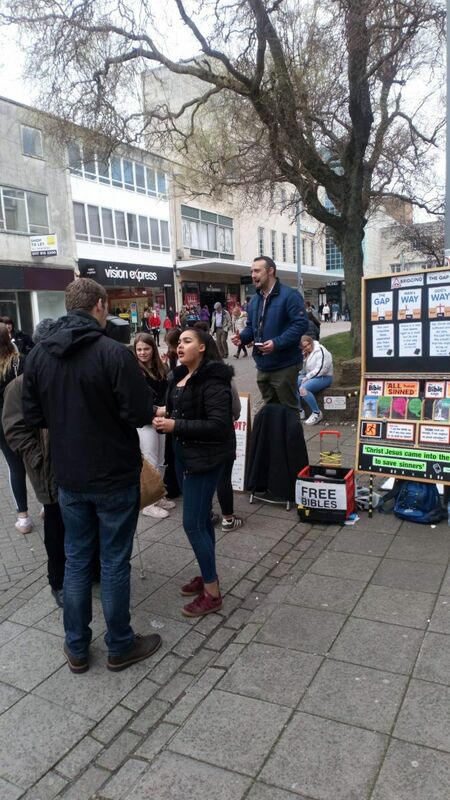 There was a large team of adults and children, including newbies which was very encouraging, to run the flip charts and hand out gospel booklets. And the gospel booklets were specially designed and written for the local area by Good News 4 Malvern. You can read it here. In spite of low foot traffic at the show, it was a very busy time with many gospel conversations. Over 600 booklets were handed out, including one to the local MP, who also listened to a very brief gospel presentation. A highlight conversation for me was a long one with 3 young adults who asked difficult questions around the issue of homosexuality, suffering, and forgiveness. It was evident that we were loving as well as faithful in the gospel message we shared, as when the conversation came to an end, and a handshake was offered, hugs were given instead! On Sunday we ran our regular afternoon outreach in the central city. The weather was good, and plenty of people were out and about. But it was very hard to get people to stop for a conversation! It just goes to show, that it’s not always going to be easy. But Jesus is worthy of our worship in obeying His great commission - no matter the result! Each of the team eventually all had at least one gospel conversation - and who knows, it may be one of those gospel presentations God uses to lead a person to Christ. Salvation is in His hands. All glory to Him. In an evening when there were thousands of people around throughout the night, there was a team of 19 Christians that headed into Brisbane City to share the Gospel! Excitedly Kane mentions that 50-60 people heard the Gospel but the reality is it actually is higher than that, over 100 people heard the Gospel, through more than 70 conversations over the course of the evening! And if there were twice the amount of team members, there could easily have been twice the amount of conversations! Bek shares about a conversation in which she was able to share the Gospel with four people at once using the flipchart. Lastly, Andrew brings an encouragment that whilst he is often scared, in prayer he is reliant upon God and as a result God uses him. You can hear about a conversation he had with two British men about what God has done to save sinners! Praise God for raising up labourers and for encouraging the team through many conversations. We will see you next week! On Friday night there was a team of nine out and many people had the privilege of hearing the Gospel! God used feeble men and women as His messengers to the nations and He can use you too! Hear Harry share about a conversation he had with a German man that ended up lasting two hours! He answered many questions, challenged him on many points and even tagged team with another member to continue to conversation. You can even hear what the man came back and said after the conversation finished! You can also hear Matt share an encouragement for you to come on out. There are always more people that can hear the Gospel, so there will always be a need for more labourers! Don't fear, there a many seasoned evangelists on the team, that whilst not perfect will happily assist you in learning good tips and tricks in sharing your faith! Why not join the team tonight? Thursday was a really exciting day. I was going to head straight to Eastgate and do some gospel letterbox dropping as well as one to one conversations at the bus stops, but Marty posted that the OAC team would be in the Square - so I changed my plans to spend half my time in the city and half at Eastgate. And I'm so glad I did! Firstly, I offered a tract to a dude on my way to the Square and it turned into one of the best conversations I've had in a long time. He understood the gospel, and then said: "I should read the Bible". And he was blown away when I gave him one. Oh that he would take the step further from understanding and trust alone in Christ. But that's Gods job. In the Square Marty was preaching. And our "favorite" heckler was dishing out his usual. But then a guy with a microphone started interviewing the heckler. After Marty had finished preaching, we were talking when the guy, who turned out to be with Radio NZ, approached for an interview. Marty was wisely shy of talking, suspecting a trap related to the recent tragedy here in Christchurch. But strangely, I had a deep desire to talk. I've got nothing to hide. And so before I knew it, I was being interviewed by this guy. And my focus was on being upfront with the gospel - as always. At least 4 times this guy asked me if those that died in the tragic shootings were going to hell. A simple 'yes' wouldn't be right, as it needs context. I kept answering the question WITH context and in multiple ways. I did my best to be faithful, yet balanced and compassionate (the killings were WRONG, I love and am praying for my Muslim neighbors, I want them to know of the justice of God and the forgiveness found only in Christ). Afterwards, I kept thinking of better answers that I could have given. I pray that, if the interview is used, I will be represented fairly. After the interview, there was a guy, who had been listening to my interview, who I got into an amazing gospel conversation with. Apparently I had given him an Intelligence Test tract to him on a previous day, and it had impacted him. He had a Catholic background, so the long conversation focused on salvation by faith vs works. I praise God for those 3 opportunities to share of Him and His love! And it didn't end there, as I then spent 2 hours in non stop gospel conversations at the Eastgate bus stops. This was just around the block from the 2nd mosque that was attacked, and it was so sad seeing the blocked off streets. But it was so awesome being able to talk with people who had been impacted by the terrible event and share hope with them. Today, Friday, saw the team in Cathedral Square and Cashel Mall using the flip chart and tracts. At 1:30 pm we, along with everyone else in NZ, paused for 2 minutes of silence in remembrance of those who had lost their lives a week earlier. Please keep praying for Christchurch: for those that have lost loved ones in the despicable attacks, that my interview - if used - would be faithful of God, for laborers for the harvest, and that the lost will hear the gospel of Jesus - before it's too late!